"This is a good way to use leftover ham, quite inexpensive, and VERY tasty. I hope that you enjoy it. Some people like to add carrots or other types of vegetables. Don't forget to serve with buttered bread toasted in the oven." In a medium pot, saute onions in oil. Add the split peas, ham bone, and enough water to cover ingredients; season with salt and pepper. Cover, and cook until there are no peas left, just a green liquid, 2 hours. While it is cooking, check to see if water has evaporated. You may need to add more water as the soup continues to cook. Once the soup is a green liquid remove from heat, and let stand so it will thicken. Once thickened you may need to heat through to serve. 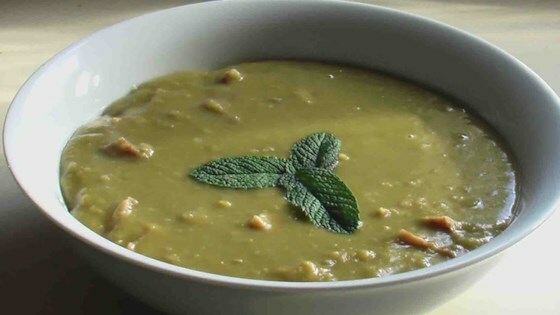 This delicious split pea soup takes only a few minutes to prepare. i always soak my peas overnight,,2 reasons , they cook faster and the more you soak and keep changing the water the less gas you will have from the peas! great recipe!